Given the fast changing nature of the gambling sector and the current hot topic of the integrity of sport it was with great anticipation I attended the 4th annual Sport & Gambling 2011 conference on Thursday 29th September, organised jointly by the World Sports Law Review and World Online Gambling Law Report, at the Law Society in London.The programme encompassed a variety of topics in relation to the legal, financial, educational and integrity issues between the sport and gambling sectors. The first session of the day was given by Nick Tofiluk of the Gambling Commission who gave an honest and thought provoking overview of the objectives, work of and challenges facing the national regulator in this area. It was interesting to learn that he considered the organisations primary strategic challenge to be the aligning of national and international approaches to the regulation of gambling, which currently varies wildly from country-to-country. 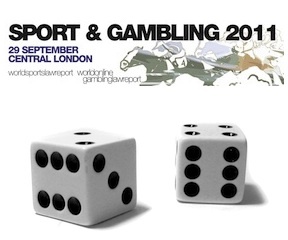 I was told by a delegate from a leading sport governing body (‘SGB’), that holds events worldwide, that this provided great frustration and bred a reluctance to engage too greatly with the gambling sector. Mr Tofiluk stressed that at its core the issue of corruption in the gambling sector is one of people versus people, and that due to cultural resistance it is necessary to target the hearts and minds of people at the earliest opportunity through continuous education. However overall, given the recent report by the Sports Betting Integrity Panel (‘SBIP’), he felt positive about the position the UK was in moving forward in regulating gambling. The next two presentations were far more commercial in nature focussing on sponsorship, one being given by a representative of Sport+Markt (the leading research and consultancy company in international sport business) and the other a representative of the European Sponsorship Association (the trade organisation of the sponsorship industry in Europe). Regrettably, perhaps due to a shortage of time and perhaps due to the delegates being primarily lawyers, each presentation came across as being a little more promotional than informative, particularly the first of the two. Nevertheless both were of general interest and it always good to have perspectives from those who work in different segments of an industry. The final piece of the opening session was a short but highly informative update by Stephen Ketteley (partner at DLA Piper) on the financial relationship between gambling and sporting operators. He highlighted how week-by-week gambling operators were looking into new territories, for example recently there has been much interest in Lichtenstein and Romania, with emerging markets for the sector being Greece and Denmark. However, of most interest was the description of how gambling operators in the this country are providing new free products to the US market, which currently prohibits sports betting and online gambling, in anticipation of a relaxation of the gambling laws in the foreseeable future. After the first networking and refreshment break Paul Scotney, Director of Integrity Services at the British Horseracing Authority (‘BHA’), then gave a fascinating insight into how a SGB identifies suspicious betting patterns. He stressed the importance of separating ‘irregular’ from ‘suspicious’ betting patterns, and gave the somewhat unusual view that blaming illegal gambling markets for corruption does not work for the majority of sports in the UK, rather it is manipulation in the legal betting markets that provide the biggest threat. In highlighting recent examples of suspicious betting across a range of sports, he said that a major problem was that many of these cases were not being properly investigated, leading to a loss of confidence by the participants and supporters, but that in his experience investigation is akin to the approach taken to fraud and it does take a long time and significant use of resources. Despite this he was strongly of the opinion that SGBs need to take primary responsibility as, formerly being a member of the police force for many years, sporting corruption is not high on the list of priorities for the police, especially in the UK. The final presentation before lunch was given by Andy Cunningham, the Head of Integrity at Betfair, an organisation that now works closely and shares a great deal of intelligence with the BHA having pioneered the use of Memorandums of Understanding to share information with sporting bodies free of charge. He provided an insight into how Betfair identifies suspicious betting patterns and stressed that the key question for them was “Is there a reasonable explanation for the unusual betting activity?” A further crucial aspect in their investigative process is that it is a business decision for them and the regulator in deciding whether to ultimately pursue a case and/or suspend or close an account of a Betfair user. A highly distinguished and decorated guest was the final person to address conference before lunch, Sir Ronnie Flanagan, whose current role is Chairman of the anti-corruption unit of the International Cricket Council (‘ICC’), an organisation which has faced high profile match and spot fixing problems in the recent past. He began with a light hearted Winnie the Pooh anecdote with a serious message, and one which I think is not stated enough, that the industry needs to think of better and more creative ways of tacking corruption and attending conferences can provide the catalyst. He repeated throughout that in his opinion sport has to be tough but scrupulously fair. For the ICC the key tenets of their programme are: a strong code of conduct; education; vigilance; monitoring; and investigation. Having had various roles within policing over the years he believed strongly that personal relationships and contacts need to be formalised to become more effective and that people with similar roles in other sports need to engage further and share knowledge. In the accompanying panel discussion Mr Scotney fielded a question in relation to a worry across sport about the vast types of bets being offered by operators. Being a member of the Sports Betting Group, formed in light of the SBIP report, he was in a unique position to reveal that the Group are concerned about this and discussions are going to be held with operators. However the Group are not concerned about in-play betting as they realise many sports depend upon it. The first speaker post lunch was another highly respected speaker, Rick Parry, speaking in his capacity as former Chairman of the now disbanded SBIP. He gave a helpful summary of the SBIP report which made a number of recommendations in relation to: rules; education; intelligence; and the licensing of betting operators. He praised the work of UEFA in maintaining a sophisticated database of integrity intelligence and committing millions of Euros per year in the process, and dispelled the myth that SGBs have to stand back in matters where police investigations are also taking place. Continuing the topic of integrity came a well thought and informative update from an international perspective by Huw Roberts of the International Association of Athletics Federations legal counsel. His starting point was that currently there is a widely divergent approach between SGBs but there is a recognition of a need to do more as evidenced by the International Olympic Committee creating expert working groups, in anticipation of the London 2012 games, in the areas of: education/information; monitoring, intelligence and analysis; and legislation and regulations, who are due to report back in Q4 2011. He also summarised the work of other international bodies, such as SportAccord and the EU, who are rolling out initiatives in relation to: integrity units; model rules; education programmes; and the possibility of an international legal instrument for betting and integrity across all sports. The next topic, one which I feel is paramount in tackling corruption in sport, was player education, presented by Simon Taylor of the Professional Players Federation who have been leaders in this area in recent times. He began by stating some worrying statistics that 60% of football players did not rules about inside information and 40% did not know about betting rules. The remainder of his presentation consisted of an interactive multiple choice quiz for the delegates in the areas of: rules; risks and approaches; and reporting obligations, based on a quiz given to players. Thankfully as a group we got all the right answers! In terms of the latter area he advocated the introduction of anonymous call lines as a way to encourage players to come forward, an approach recently used by UEFA in the FK Pobeda case and supported by the Court of Arbitration for Sport. Overall his presentation was a refreshing yet informative and welcome change from the usual conference fare. The final session of the day focussed on another controversial and highly topical of the right to offer bets and the betting levy. A legal perspective on the topic was given first by John Cloke of DLA Piper. The scope of the area meant that unfortunately the presentation was delivered too quickly for the audience to really keep pace and get a true understanding of the myriad of issues. However it was interesting to hear, as a lawyer with some EU & competition experience, how if the right to bet is framed as a property right competition law and EU freedom of movement rules will regulate how much freedom the owner will have. An additional tax – goes against current UK review of tax regime to encourage business. Will Lambe, Head of External Affairs at the BHA, followed with the sporting perspective. He was critical of the current (yet antiquated) betting levy for horse racing levy as it only applies to UK based operators and now only two of the top twenty operators are actually based in the UK, with the rest being offshore. This means that horse racing’s principal source of income has fallen by half since its peak in 2007/08. He stated that the BHA would rather the free market determine the amount to be paid through independent commercial agreements with gambling operators. Interestingly Ms Gill agreed that commercial relationships would be the best way forward for all. Though not before blaming the BHA for its own current predicament as when Betfair launched, revolutionising the gambling market, the BHA attacked them rather than engaging in conversation and tapping into Betfair's younger client base. She also stated that putting forward the integrity of sport as a justification for the right to bet was a Trojan horse as both SGBs and gambling operators should concentrate on running their own business. The day provided a topical and varied insight from various stakeholders into the numerous difficult and emotionally charged issues facing sport and gambling.